Francis is closely related to the emperor of Hayti [/Haiti]. His father, Thomas Francis, was born in Martinique in 1789 and lived in Guadaloupe. His grandfather, Augustus, also born in Martinique. 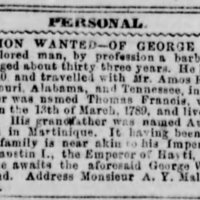 An antebellum ad.